What do we have in this chapter 1 part 1? Winsock is a standard application programming interface (API) that allows two or more applications (or processes) to communicate either on the same machine or across a network and is primarily designed to foster data communication over a network. It is important to understand that Winsock is a network programming interface and not a protocol. Winsock provides the programming interface for applications to communicate using popular network protocols such as Transmission Control Protocol/Internet Protocol (TCP/IP) and Internetwork Packet Exchange (IPX). The Winsock interface inherits a great deal from the BSD Sockets implementation on UNIX platforms. In Windows environments, the interface has evolved into a truly protocol-independent interface, especially with the release of Winsock 2. The examples presented in this chapter help to provide an understanding of the Winsock calls that are required for accepting connections, establishing connections, and sending and receiving data. Because the purpose of this chapter is to learn these fundamental Winsock calls, the examples presented use straight blocking Winsock calls. You can differentiate the two functions with the WSA prefix. 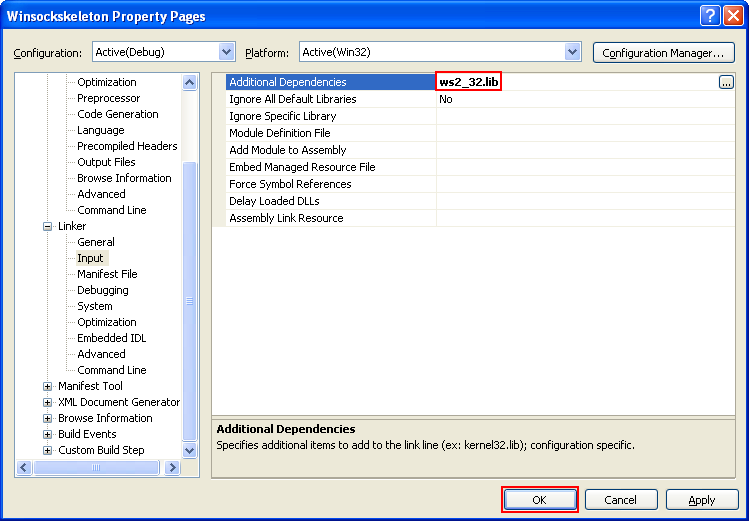 If Winsock 2 updated or added a new API function in its specification, the function name is prefixed with WSA. For example, the Winsock 1 function to create a socket is simply socket(). Winsock 2 introduces a newer version named WSASocket() that is capable of using some of the new features made available in Winsock 2. There are a few exceptions to this naming rule. WSAStartup(), WSACleanup(), WSARecvEx(), and WSAGetLastError() are in the Winsock 1.1 specification. If you fail to find the related Winsock headers in your machine or programming environment, you may want to read Visual .NET doc 1 and Visual .NET doc 2 articles first. 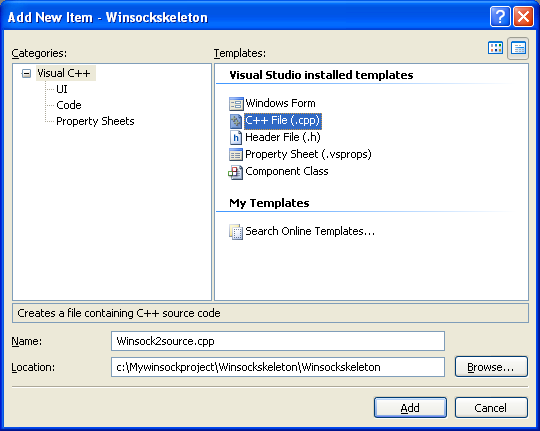 Those articles also show how to add the Winsock link library, ws2_32.lib to the Visual C++ project. 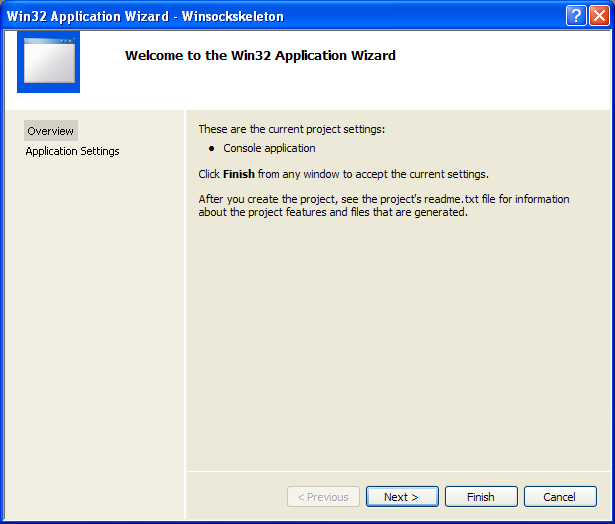 When developing new applications you should target the Winsock 2 specification by including WINSOCK2.H in your application. 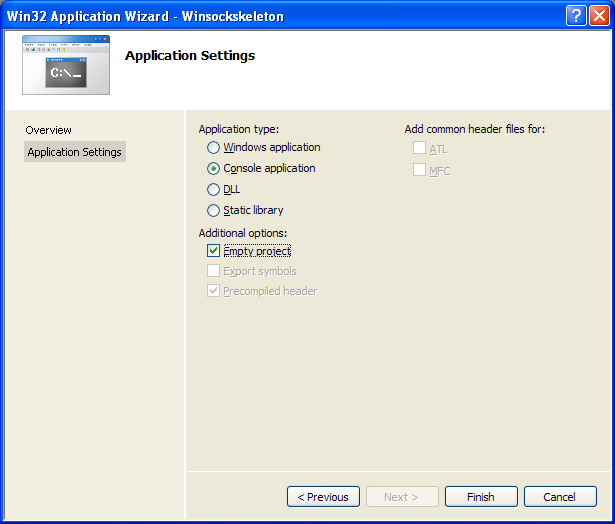 For compatibility with older Winsock applications and when developing on Windows CE platforms, WINSOCK.H is available. There is also an additional header file: MSWSOCK.H, which targets Microsoft-specific programming extensions that are normally used for developing high performance Winsock applications. When compiling your application with WINSOCK2.H, you should link with WS2_32.LIB library. 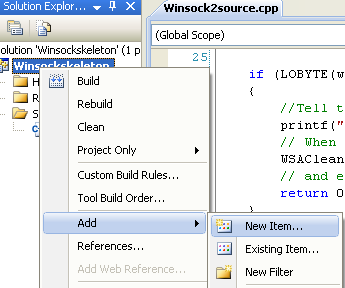 When using WINSOCK.H (as on Windows CE) you should use WSOCK32.LIB. If you use extension APIs from MSWSOCK.H, you must also link with MSWSOCK.LIB (get the idea here - VC++ .NET or here - VC++ 6). Once you have included the necessary header files and link environment, you are ready to begin coding your application, which requires initializing Winsock. 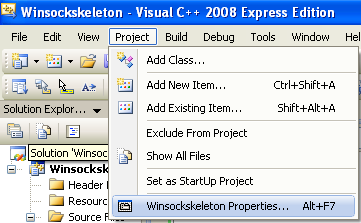 WSAStartup() sets the first field, wVersion, to the Winsock version you will be using. The wHighVersion parameter holds the highest version of the Winsock library available. Remember that in both of these fields, the high-order byte represents the Winsock minor version, and the low-order byte is the major version. The szDescription and szSystemStatus fields are set by the particular implementation of Winsock and aren't really useful. Do not use the next two fields, iMaxSockets and iMaxUdpDg. They are supposed to be the maximum number of concurrently open sockets and the maximum datagram size; however, to find the maximum datagram size you should query the protocol information through WSAEnumProtocols(). The maximum number of concurrent sockets isn't some magic number, it depends more on the physical resources available. Finally, the lpVendorInfo field is reserved for vendor-specific information regarding the implementation of Winsock. This field is not used on any Windows platforms. Failure to call WSACleanup when your application exits is not harmful because the operating system will free up resources automatically; however, your application will not be following the Winsock specification. Also, you should call WSACleanup for each call that is made to WSAStartup. A call to the function after an error occurs will return an integer code for the particular error that occurred. These error codes returned from WSAGetLastError() all have predefined constant values that are declared in either WINSOCK.H or WINSOCK2.H, depending on the version of Winsock. The only difference between the two header files is that WINSOCK2.H contains more error codes for some of the newer API functions and capabilities introduced in Winsock 2. 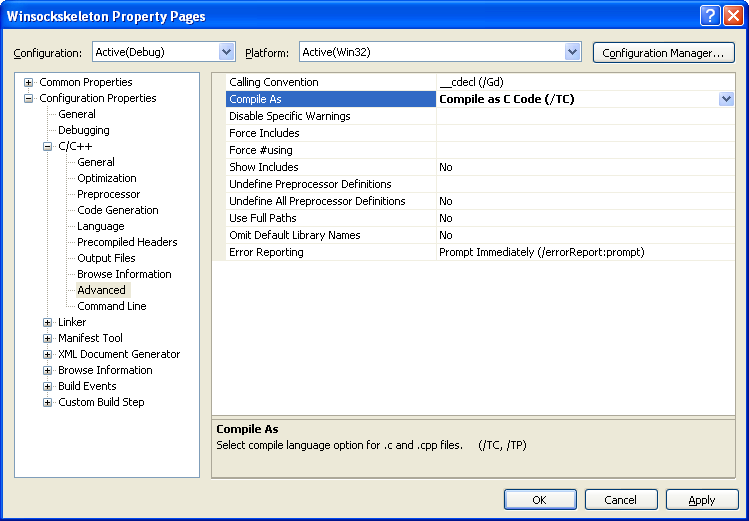 The constants defined for the various error codes (with #define directives) generally begin with WSAE. On the flip side of WSAGetLastError(), there is WSASetLastError(), which allows you to manually set error codes that WSAGetLastError() retrieves. 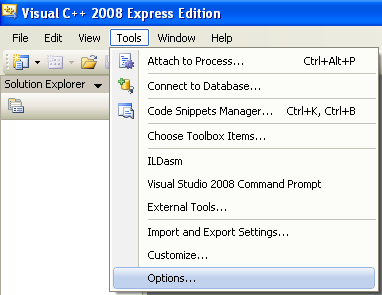 Let try this program using Visual C++ 2008 Express Edition. First and foremost let change the newly installed VC++ startup page to last loaded solution. You can skip this ‘optional’ step. Click Tools menu > Options sub menu. 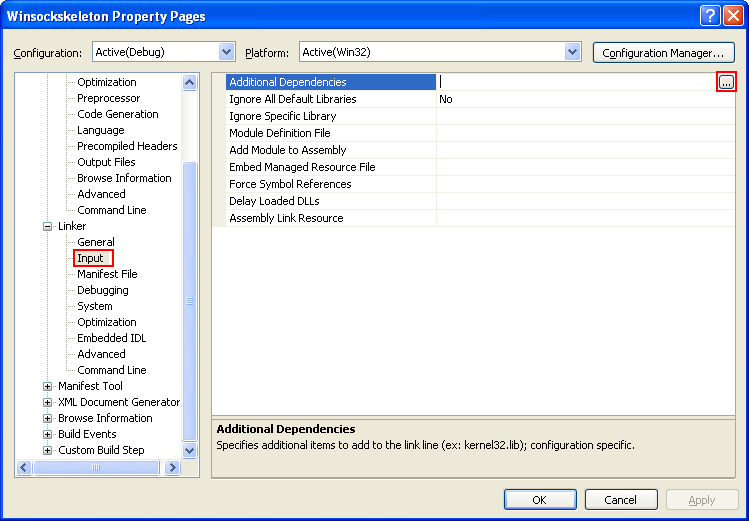 Expand Environment folder > Select Startup link > Set the At Startup: to Load last loaded solution > Click OK.
1. 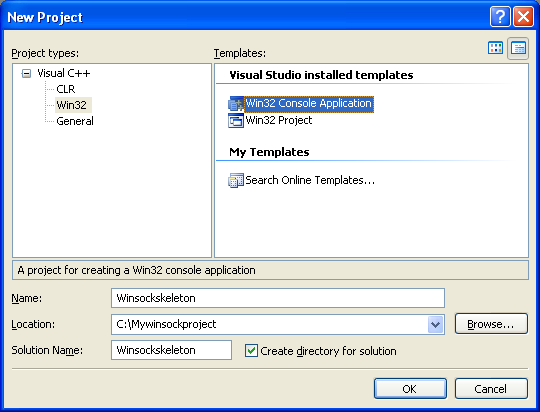 Then we can start creating the Win32 console application project. Click File menu > Project sub menu to create a new project. 11. Manually, type the library name and click OK.
12. 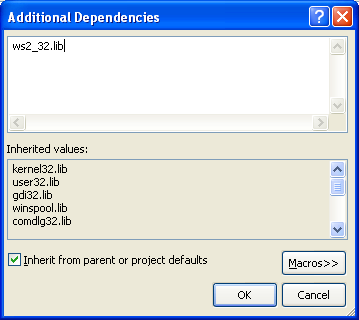 Or you can just directly type the library name in the empty field on the right of the Additional Dependencies. Click OK.
13. 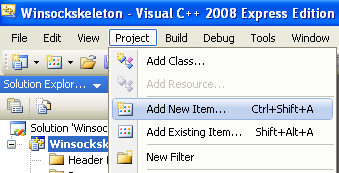 Build the project and make sure there is no error which can be seen (if any) in the Output window normally docked at the bottom of the IDE by default. 15. If there is no error, a sample of expected output is shown below. Well, after completing this exercise you should be familiar with the steps to create an empty Win32 console application project. Those steps will be repeated for almost all the Winsock2 projects in this tutorial. Now we are ready to describe how to set up communication using a network protocol.